Dark-Types in Pokémon GO fill in a niche when it comes to PvP battles. They have found their place in Raids and Gym battles, but when it comes to PvP, that’s a whole other story. The stats, honestly, are all over the place for this typing. From one Pokémon being a total offensive monster to another being a complete tank and everywhere in between. Perhaps one of these Pokémon will find a spot on your PvP teams? Especially if you’re planning to play in the Twilight Cup tournament, this guide will serve as a primer on Dark-Types in PvP. Dark-Type Pokémon can deal massive damage to Psychic and Ghost-Types while also dealing neutral damage to Normal, Fire, Water, Electric, Grass, Ice, Ground, Flying, Bug, Rock, Dragon and Steel-Types. Of course, this is assuming you are using a Dark move. As mentioned above, there are some Dark-Type Pokémon that can really bring the offensive weaponry. Unfortunately, there aren’t a lot of “high” attack ones to choose from. So, if you’re trying to deal massive damage, choose wisely! Oddly enough, defense is where this type shines. With only three weaknesses, Bug, Fighting, and Fairy, there isn’t much to worry about. Bug-Types aren’t as commonly used as they should be and there aren’t very many Fairy moves currently in Pokémon GO (especially a Fairy quick move) either. Fighting-Types, however, are the most common. Since a lot of Dark-Types have good bulk, this disadvantage may not be an issue depending on you’re circumstances. * Since Alolan Muk can’t be 1500 CP or under for the Great League, you’d have to trade for it. The stats chosen were for an IV combination of 9/9/9. All quick moves were chosen based on the best EPT ratings (energy per turn). All charge moves were chosen based on the lowest energy needed to fire off (except for Fire Blast on Houndoom). All stats were chosen to be a perfect 15/15/15 for an easy stat comparison. Umbreon is a straight up tank. It shines best in the Great League bolstering both an insane DEF and HP stat. This alone helps Umbreon dominate super effective/neutral match ups. In a disadvantage against a Bug or Fairy type, Last Resort has low enough energy (55) to deem a worthy fight. Yet, in a Fighting type matchup, I’m afraid Umbreon might not be up to the task. Regardless, this Dark-Type behemoth is a fantastic Pokémon to use in the Great League and a decent choice for the Ultra League (Hariyama is very common in Ultra League). Alolan Muk is all around good. Its stats are very well rounded regardless of any League you’d like to use it in. That’s what makes it such a viable Dark-Type option. Dark Pulse charges up fast enough (50 energy) to deal great STAB damage and Sludge Wave isn’t terribly slow itself being a 1 bar charge move (65 energy). The only downside is it can’t cover its one and only weakness, Ground. Aside from that, Alolan Muk can definitely take down a Fairy, Psychic or Ghost type Pokémon you throw in its way! 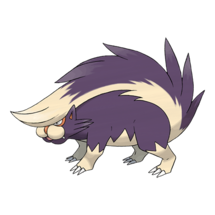 As the name suggests, Skuntank is a TANK! Leading with the best HP stat in both the Great and Ultra League charts above, Skuntank can take the hits. It can really shine in either league actually. 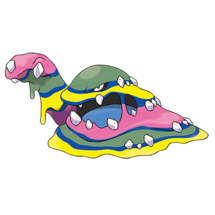 Unfortunately, just like Alolan Muk, it doesn’t have any charge moves to cover its Ground weakness. But only having ONE weakness is a plus for such a beefy Pokémon. I highly recommend this Pokémon to counter Azumarill in the Great League or even Togekiss in the Ultra League. Give it a try! Another Pokémon with only a Ground type weakness? YEP! The interesting thing is, with Infestation Bug as a quick move, Drapion can win a Dark-Type vs. Dark-Type match up. It can also cover its own weakness with Aqua Tail Water. Aqua Tail is one of the fastest charging moves as well (only 35 energy). This makes Drapion a very versatile Pokémon. Its stats are pretty solid for the Great League, which is heavily weighted on type coverage moves (Drapion fits the bill). As for the Ultra League, Drapion shines even more because it can have its stats maxed out. Now Drapion is a relatively new and hard to obtain Pokémon. But if you have one, give it a few test runs! UPDATE: Drapion now has access to Bite Dark as a quick move. Although it deals heavy DPT, its EPT is still poor (2 vs Infestation’s 3.76). Thus making Infestation a better choice and a clear cut winner in a Dark vs Dark matchup. Shiftry is an interesting Dark-Type Pokémon. It has a dual typing with Grass and has access to one of the best Grass-Type charge moves in PvP, Leaf Blade. Because of this, Shiftry has a lot more versatility in the Great League. This is especially true since Water types are so common in the Great League (i.e. Azumarill, Blastoise, Whiscash, etc…). Having the highest attack stat compared to the others listed above is a plus as well. 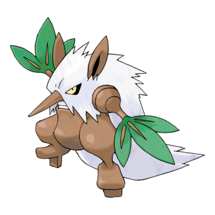 Another thing to consider is Shiftry might hold its own against a Fighting type matchup due to Leaf Blade dealing devastating neutral STAB damage (this scenario does depend on the Fighting Pokémon). As for the Ultra League, give it a try. It can shine under the right circumstances, but I don’t think it should be a staple on any team due to how common Fighting types are in that league. Honchkrow is a skull crushing, border-line glass cannon. Due to the nature of Pokémon stats in the Ultra League, this is where Honchkrow can perform best. If you look at the tables above, there isn’t much difference in Honchkrow’s stats between the Ultra and Master League. One thing worth mentioning is the fact that Sky Attack Flying is now an available charge move. Thankfully, Sky Attack will charge up very fast (only 45 energy) and deal heavy STAB damage of 80. So when faced up against a powerful Fighting or Bug-Type that will deal strong neutral damage against you, Sky Attack can one hit these opponents! 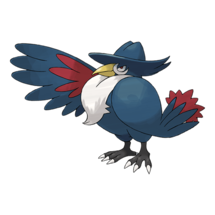 As far as any other type coverage goes, Honchkrow simply does not have access to any other charge moves. If you think your opponent may throw out an Electric, Ice, Fairy, or Rock-Type Pokémon, leave Honchkrow at home. Unless you like to roll the dice! Okay, let’s address the elephant in the room. Not only does Weavile have a weakness to Bug, Steel, Fire, Rock, Fairy, and Fighting-Types, it also takes double the damage from any Fighting move. Although Weavile can be a good choice in the Ultra League, I don’t recommend it due to Hariyama being so common. You could argue Machamp being common in the Master League as well, but Weavile will still shine more in that League regardless. 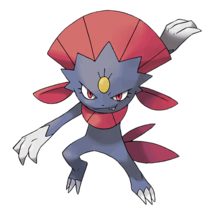 The moves Weavile has access to are great and can easily take down one of those common Dragon-Type Pokémon that your opponent will most likely throw at you in the Master League. Good ole Tyranitar… Where do I even begin? First off, Tyranitar benefits most from being maxed out for the Master League. Its stats are impeccable. 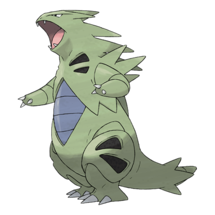 Combine that with a fast move that deals the most possible DPT (4.0 is the highest DPT) and with charge moves that fill up quickly, Tyranitar is a recipe for destruction! The main downside is it too is extremely weak to Fighting moves and will gain absolutely zero ground in a Fighting type match up. On the other hand, Tyranitar is great for going up against Lugia, Metagross, Latios, Latias and Mewtwo. This is sort of a wild card. Its stats are mediocre compared to the others listed. But it does have access to Snarl (3.33 EPT) coupled with Crunch (45 energy). This Dark moveset alone is enough to win a battle as long as you’re dealing super effective damage. Be wary of Fighting-Types in both leagues. 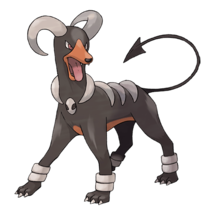 Ideally, Houndoom would be a solid choice if you’re going up against any of these types: Ice, Steel, Grass, Ghost, Fire and Psychic-Types. If only it had access to Flamethrower… UPDATE: It now does! Giving Houndoom a LOT more viability for use in unique situations! There are a TON of good Dark-Types to choose from. Due to that, there are some that I did not list. So with that being said, we want to hear from you! 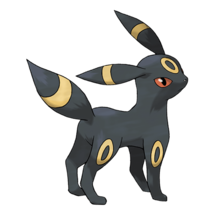 What are some other good Dark-Types? Ones you’ve tested that are tried and true PvP battlers! Feel free to share your thoughts in the comments.